Psychologist Chicago: What is Unconditional Self-Acceptance? Unconditional self-acceptance teaches us to accept all aspects ourselves because we are unique, and to be forgiving of ourselves because we are fallible. Practicing USA instead of relying on conditional self esteem increases our ability to rationally cope with adversity. If we base our self esteem on our ability to successfully achieve status, we will be unable to unconditionally accept ourselves. It is important that we strive towards short- and long-term goals for growth and improvement if we value these things, but we run into the risk of engaging in self-condemnation when we demand that we must achieve these milestones, because otherwise we will not value ourselves nor will we feel valued by others. 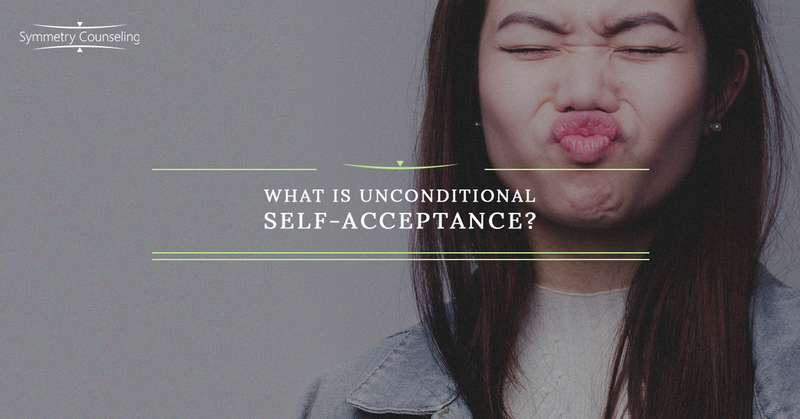 When we put conditions on our self-acceptance, we are likely setting ourselves up for failure. First, the conditions for self-acceptance may simply be unattainable, requiring time or skills or resources that are beyond our reach. In this case, if the conditions are not met, it becomes virtually impossible to accept ourselves. Secondly, let’s say we set conditions for self-acceptance that are reasonably attainable, such as getting married, graduating from school, getting promoted at work, purchasing a home, or achieving other life milestones. The problem with this type of conditional self-acceptance is that it is unlikely that we will stop setting new conditions once the first ones are met. For instance, we may now demand another promotion, a higher pay rate, a larger home, or an advanced degree in order to accept ourselves. Self-esteem is problematic since its measurements rely solely on our successes. We may feel good about ourselves when we perform well, but we will not always perform well. We will all fail and we will all underperform because we are human. It has happened before and is bound to happen again, (likely sooner rather than later). So when we fail or underperform, does this mean we are undeserving of feeling good about ourselves? Of course not, and unconditional self -acceptance rejects this notion. Then there is the pratfall of comparing ourselves to others. Pretty much no matter what we achieve in our lives, there will always be someone who is doing better than us, and there will always be somebody doing worse. There is no benefit in rating ourselves compared to others since it only serves as an excuse to neglect our wants, or to give ourselves a pass in striving to do better. Comparison to others also conveniently ignores the subjectivity of our unique life experiences and circumstances, and also relies heavily on making assumptions about ourselves, others, and the world as a whole. So let’s aspire to only rate our actions, thoughts, and feelings, but not ourselves. We can learn to accept ourselves unconditionally because we are fallible and capable of making changes in thought and behavior at any time. We may strive to achieve certain milestones in our lives but we will stubbornly refuse to rate ourselves based on whether we accomplish them. Let’s also resist the urge to view ourselves negatively based solely on the acceptance of other people. By practicing unconditional self-acceptance, we will significantly reduce the risk of turning our productive and rational desires into unproductive and irrational demands. To learn how to practice unconditional self-acceptance and the other rational coping skills, contact Symmetry Counseling today to connect with one of our thought and behavior change specialists.